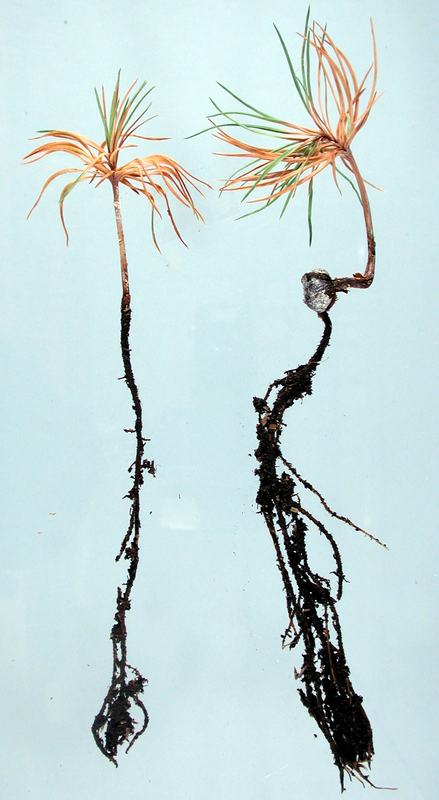 Douglas-fir seedling wilting due to infection with Pythium irregulare. 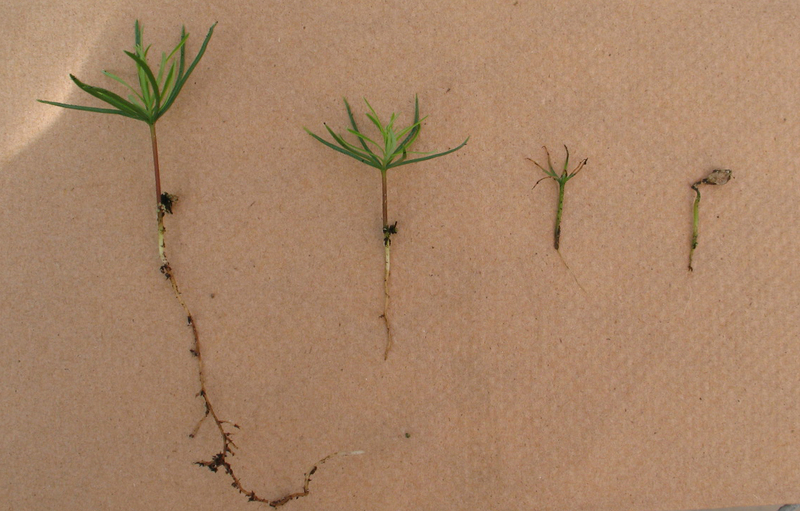 Douglas-fir seedling with with Pythium irregulare - healthy plant on left, 3 diseased plants on right. Fusarium stem canker on these sugar pine seedlings. Disease and weed pressure in nonfumigated plot (top right side image and foreground bottom image right) compared to fumigated plot (top left side and bottom image background). Same seed lot for both plots. Damping-off is a disease of germinating, and newly emerged, conifer and hardwood seedlings that results in decay of succulent tissue, wilting, and seedling death. Many species of pathogenic fungi can cause damping-off. Some of the factors influencing damping-off include pathogen populations, host susceptibility, soil temperature, moisture, and pH. The severity of damping-off can vary from field to field and year to year depending on these factors. Managers can reduce damping-off losses in nursery beds with an integrated program of cultural and chemical practices. Damping-off is caused by various pathogenic fungi that infect seedlings during germination and after emergence when the seedling tissue is succulent. Four to six weeks after emergence, the seedlings develop woody tissue and the susceptibility to damping-off fungi quickly declines.31, 37 The fungi that cause damping-off vary depending on the host and location. The most common damping-off fungi are species in the genera Fusarium, Phytophthora, Pythium, and Rhizoctonia.6, 14, 23, 29, 33, 38 Other fungi that occasionally cause damping-off include Cylindrocladium spp., Botrytis cinerea Pers., Sphaeropsis sapinea (Fr.) Dyko and Sutton,15 Macrophomina phaseolina (Tassi) Goid.,6 Alternaria alternata (Fr.) Keissler, Cladosporium cladosporioides (Fres.) de Vries, Penicillium expansum Link20 and Phoma spp.33 Many of these fungi are weak pathogens that invade the succulent tissue of germinating seedlings under environmental conditions that favor the pathogen6 and reduce early seedling growth and vigor.14 These fungi can be present in soil and organic matter,14, 20 and on seeds.15, 20 Sterilized or fumigated soil can be re-colonized by damping-off fungi carried on by wind (on soil particles), water, contaminated equipment,39 mulch, or seed. Pre-emergence damping-off occurs when fungi infect developing radicals and kill seedlings while shoot tissues are still below ground.14 Random pockets of poor seedling emergence are an indication of pre-emergence damping-off. However, other problems can cause similar effects, including non-uniform seeding of containers or beds, poor seed development, seed decay, and removal of mulch or soil by wind and rain. Post-emergence damping-off lesions may be confused with heat lesions.17 Heat lesions develop just above the groundline, are usually whitish, and are often located on one side of the stem in the early stage.17 Heat lesion damage occurs scattered throughout nurseries and is dependent on patterns of shade and heat buildup,18 while damping-off often occurs in expanding patches. The environmental conditions in which seedlings are grown usually have the greatest influence on the development of damping-off. However, the specific conditions that promote damping-off depend on the pathogens present. Phytophthora. In general, Phytophthora diseases are promoted by water-saturated soils13 and increasing pH up to 8.0.34 Acidifying soil to a pH of 4.6 controlled damping-off of black locust (Robinia pseudoacacia L.) by P. parasitica Dast.24 The effects of temperature and nitrogen on Phytophthora diseases are variable for other crops, and have not been well documented for damping-off of forest tree species in the United States. Nursery managers can reduce damping-off by promoting fast germination and good seedling growth.14 Managers have a great deal of control over the factors that affect damping-off in the field, outside of the weather. Soil drainage, organic matter, and pH can be influenced. The timing and depth of sowing and irrigation can be controlled to improve germination. Nitrogen application can be delayed until seedlings are past the danger of damping-off. If necessary, fumigants and fungicides are available to control disease development. Sowing. Usually seeds are sown when conditions are most favorable for fast and even germination. However, managers may be forced to sow seeds in an unusually warm or wet spring. This may favor fast germination but will require greater attention to watering. To avoid damping-off, soils should be irrigated to the depth of the growing roots without flooding the soil. Fungicides. Fungicides are used in many forest nurseries in an attempt to prevent damping-off, however, results are erratic.22, 23, 33 In general, fungicides are most effective when targeted at a specific pathogen and applied prior to disease development. Since predicting damping-off is difficult,41 managers often rely on experience with the pathogens and conditions that cause damping-off, and the fungicides, if any, that provided some control. To determine if a fungicide in use is providing control of damping-off, a few untreated plots can be established in the beds or containers. This test may have to be repeated for several years to get an accurate assessment of a fungicide’s efficacy. When a new chemical is to be used, it can be tested in a small area before it is applied to the entire crop. Thiram is the most commonly applied seed treatment for use as a bird and small mammal repellant as well as a fungicide for specific damping-off pathogens, such as Fusarium,3, 26 Pythium and Rhizoctonia.38 Thiram has been shown to increase germination of southern pine seed with poor germination rates of 33% or less.3 However, thiram has also been shown to delay or reduce germination of seeds of longleaf pine, and slash pine,32 as well as some tree species including Douglas-fir,5 red pine,4 and white spruce.12 Few studies have determined whether the benefit of thiram as an animal repellent and fungicide exceeds its possible phytotoxic effect in the field. Hydrogen dioxide is a surface sterilant registered as a fungicide for tree seed. Hydrogen dioxide will reduce recovery of Fusarium spp. on longleaf pine seed without phytotoxicity.1 Seed treatments with sodium hypochlorite (bleach) and hydrogen peroxide can reduce pathogenic fungi on the seed coat and improve seed germination.2, 7 But these seed treatments can also reduce seed germination depending on the species, concentration, and duration of application.2, 7 Cleansing seed surfaces with a running water soak for 48 hours is a non-toxic treatment that relies on mechanical removal of pathogens.7 This treatment can be used in combination with sterilants as a rinse. Damping-off is a common disease problem in forest nurseries during the first 4 to 6 weeks after sowing. The primary fungi involved in damping-off are Pythium, Rhizoctonia, Fusarium, and Phytophthora species. Many damping-off fungi are relatively weak pathogens that require environmental conditions that favor infection. The severity of damping-off is highly dependent on whether the soil moisture, temperature, and pH are more beneficial to the growth of the host or the pathogen. Other factors that can affect development of the disease, aside from host susceptibility and pathogen populations, include the level of available nitrogen, presence of antagonistic microorganisms, and variation in pathogenicity within a fungal species. Managers can reduce the risk of damping-off by promoting environmental conditions for fast germination and good seedling growth. Fumigants and fungicides can also be used to reduce populations of pathogens and prevent seedling infection. Pesticides can be phytotoxic and should be used with caution. 1 Allen, T.W., Enebak, S.A., and Carey, W.A. 2004. Evaluation of fungicides for control of species of Fusarium on longleaf pine seed. Crop Protection 23:979-982. 2 Barnett, J.P., and Pesacreta, T.C. 1993. Handling longleaf pine seeds for optimal nursery performance. Southern Journal of Applied Forestry 17(4): 180-186. 3 Barnett, J.P., and Varela, S. 2003. Producing high-quality slash pine seeds. In: Riley, L.E., Dumroese, R.K., and Landis, R.D. (eds.). National Proceedings: Forest and Conservation Nursery Associations – 2002. Ogden, UT: USDA Forest Service, Rocky Mountain Research Station. Proceedings RMRS-P-28. p. 52-56. 4 Belcher, J., and Carlson, L.W. 1968. Seed-treatment fungicides for control of conifer damping-off: laboratory and greenhouse tests, 1967. Canadian Plant Disease Survey 48(2) 87-52. 5 Bloomberg, W.J., and Trelawny, J. 1970. Effect of thiram on germination of Douglas-fir seed. Phytopathology 60:1111-1116. 6 Boyce, J.S. 1961. Forest pathology. 3rd ed. New York: McGraw-Hill. 572 p.
7 Campbell, S.J., and Landis, T.D. 1990. Managing seedborne diseases in western forest nurseries. Tree Planters’ Notes 41(4): 3-7. 8 Chakravarty, P., Peterson, R.L., and Ellis, B.E. 1990. Integrated control of Fusarium damping-off in red pine seedlings with the ectomycorrhizal fungus Paxillus involutus and fungicides. Canadian Journal of Forest Research 20:1283-1288. 9 Cram, M.M., and Fraedrich, S.W. 1996. Survey of southern forest nurseries: fumigation practices and pest management concerns. In: Landis, T.D., and South, D.B. (eds.). National Proceedings, Forest and Conservation Nursery Associations. Portland (OR): USDA Forest Service, Pacific Northwest Research Station. General Technical Report PNW-389. p 19-27. 10 Csinos, A.S., Sumner, D.R., Johnson, W.C., Johnson, A.W., McPherson, R.M., and Dowler, C.C. 2000. Methyl bromide alternatives in tobacco, tomato, and pepper transplant production. Crop Protection 19:39-49. 11 Davey, C.B. 1996. Nursery soil management—organic amendments. In: Landis, T.D., and South, D.B. (eds.). National Proceedings, Forest and Conservation Nursery Associations. Portland (OR): USDA Forest Service, Pacific Northwest Research Station. General Technical Report PNW-389. p 6-18. 12 Dobbs, R.C. 1971. Effect of thiram-endrin formulations on the germination of jack pine and white spruce seed in the laboratory. Tree Planters’ Notes 22:16-18. 13 Duniway, J.M. 1983. Role of physical factors in the development of Phytophthora diseases. In: Erwin, D.C., Bartnicki-Garcia, S., and Tsao, P.H. (eds.). Phytophthora: its biology, taxonomy, ecology, and pathology. St. Paul (MN): American Phytopathological Society. p 175-187. 14 Filer, T.H. Jr, and Peterson, G.W. 1975. Damping-off. In: Peterson, G.W., and Smith, R.S., technical coordinators. Forest nursery diseases in the United States. Washington (DC): USDA Forest Service. Agriculture Handbook No. 470. p 6-8. 15 Fisher, P.L. 1941. Germination reduction and radicle decay of conifers caused by certain fungi. Journal of Agricultural Research 62:87-95. 16 Hansen, E.M., Myrold, D.D., and Hamm, P.B. 1990. 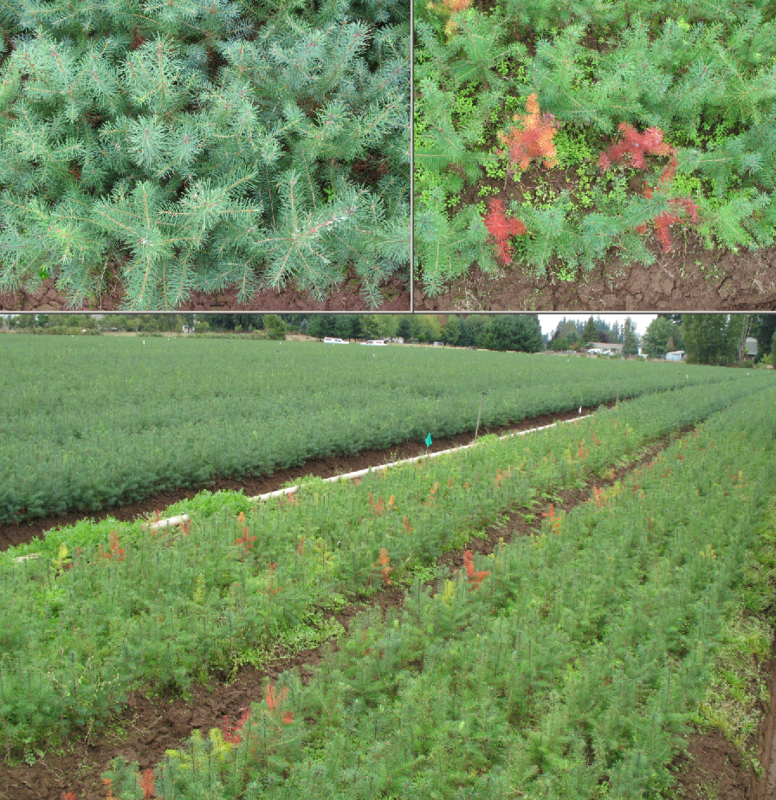 Effects of soil fumigation and cover crops on potential pathogens, microbial activity, nitrogen availability, and seedling quality in conifer nurseries. Phytopathology 80:698-704. 17 Hartley, C. 1918. Stem lesions caused by excessive heat. Journal of Agricultural Research 14:595-604. 18 Hartley, C. 1921. Damping-off in forest nurseries. Washington (DC): USDA Bureau of Plant Industry. Bulletin 934. 99 p.
19 Huang, J.W., and Kuhlman, E.G. 1990. Fungi associated with damping-off of slash pine seedlings in Georgia. Plant Disease 74:27-30. 20 Huang, J.W., and Kuhlman, E.G. 1991. Mechanisms inhibiting damping-off pathogens of slash pine seedlings with a formulated soil amendment. Phytopathology 81:171-177. 21 Jackson, L.W. 1940. Effects of H-ion and Al-ion concentrations on damping-off of conifers and certain causative fungi. Phytopathology 30:563-579. 22 James, R.L. 1988. Principles of fungicide usage in container tree seedling nurseries. Tree Planters’ Notes 39:22-25. 23 Kelley, W.D., and Oak, S.W. 1989. Damping-off. In: Cordell, C.E., Anderson, R.L., Hoffard, W.H., Landis, T.D., Smith, R.S. Jr., and Toko, H.V. (eds.). Forest nursery pests. Washington (DC): USDA Forest Service. Agriculture Handbook No. 680. p 118-119. 24 Lambert, E.B. 1936. A seedling wilt of black locust caused by Phytophthora parasitica. Journal of Agricultural Research 53: 467-476. 25 Leach, L.D. 1947. Growth rates of host and pathogen as factors determining the severity of preemergence damping-off. Journal of Agricultural Research 75:161-179. 26 Littke, W. 1997. Seed pathogens and seed treatments. In: Landis, T.D., and South, B.D. (eds.). National Proceedings, Forest and Conservation Nursery Associations; 1996 Aug 20-22; Salem (OR): USDA Forest Service, Pacific Northwest Research Station. General Technical Report PNW-GTR-389. p 187-191. 27 Papavizas, C.G., and Davey, C.B. 1961. Saprophytic behavior of Rhizoctonia in soil. Phytopathology 51:693-699. 28 Pedersen, E.A., Reddy, M.S., and Chakravarty, P. 1999. Effect of three species of bacteria on damping-off, root rot development, and ectomycorrhizal colonization of lodgepole pine and white spruce seedlings. European Journal of Forest Pathology 29:123-134. 29 Roth, L.F., and Riker, A.J. 1943a. Life history and distribution of Pythium and Rhizoctonia in relation to damping-off of red pine seedlings. Journal of Agricultural Research 67:129 - 148. 30 Roth, L.F., and Riker, A.J. 1943b. Influence of temperature, moisture, and soil reaction on the damping-off of red pine seedlings by Pythium and Rhizoctonia. Journal of Agricultural Research 67:273- 293. 31 Roth, L.F., and Riker, A.J. 1943c. 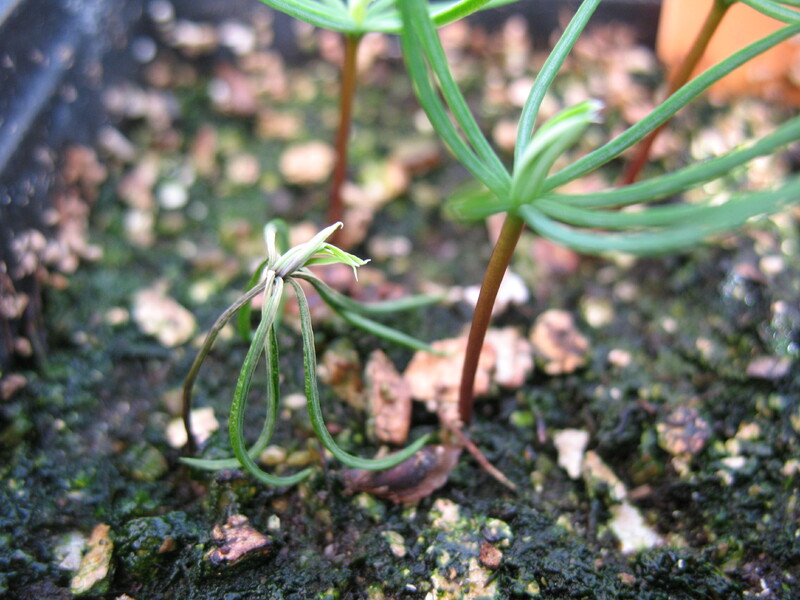 Seasonal Development in the nursery of damping-off of red pine seedlings caused by Pythium and Rhizoctonia. Journal of Agricultural Research 67:417- 431. 32 Runion, G.B., Kelley, W.D., and Land, D.H. 1991. Effects of triadimefon and thiram seed treatments on emergence of southern pines. Seed Science & Technology 19:57-66. 33 Russell, K. 1990. Damping-off. In: Hamm, P.B., Campbell, S.J., and Hansen, E.M. (eds.). Growing healthy seedlings: identification and management of pests in Northwest forest nurseries. Special publication 19. Corvallis (OR): Forest Research Laboratory, Oregon State University. p 2-5. 34 Schmitthenner, A.F., and Canaday, C.H. 1983. Role of chemical factors in development of Phytophthora diseases. In: Erwin D.C., Bartnicki-Garcia, S., and Tsao, P.H. (eds.). Phytophthora: its biology, taxonomy, ecology, and pathology. American Phytopathological Society, St. Paul, Minnesota. p 175-187. 35 Smith, R.S., and Fraedrich, S.W. 1993. Back to the future—pest management without methyl bromide. Tree Planters’ Notes 44 (3): 87-90. 36 Sutherland, J.R. 1984. Pest management in northwest bareroot nurseries. In: Duryea, M.L., and Landis, T.D. (eds.). Forest Nursery Manual: Production of Bareroot Seedlings. The Hague: Nijhoff, M., and Junk, W., Publishers, for Forest Research Laboratory, Oregon State University, Corvallis. p 203-210. 37 Tint, H. 1945. Studies in the Fusarium damping-off of conifers. II. Relation of age of host, pH, and some nutritional factors to the pathogenicity of Fusarium. Phytopathology 35:440-457. 38 Vaartaja, O. 1964. Chemical treatment of seedbeds to control nursery diseases. Botanical Review 30 (1):1-91. 39 Vaartaja, O. 1967. Reinfestation of sterilized nursery seedbeds by fungi. Canadian Journal of Microbiology 13:771-776. 40 Wright, E. 1944. Damping-off in broadleaf nurseries of the Great Plains Region. Journal of Agricultural Research 69:77-94. 41 Wright, E. 1945. Relation of macrofungi and micro-organisms of soil to damping-off of broadleaf seedlings. Journal Agricultural Research 70:133-141. 42 Wright, E. 1957. Influence of temperature and moisture on damping-off of American and Siberian elm, black locust, and desertwillow. Phytopathology 47:658-662. 43 Yang, D., and Bernier, L., Dessureault, M. 1995. Phaeotheca dimorphospora increases Trichoderma harzianum density in soil and suppresses red pine damping-off caused by Cylindrocladium scoparium. Canadian Journal of Botany 73:693-700.